Mumbai: Club Enerji, Tata Power’s nationwide movement, has been constantly working towards spreading the message of being responsible citizens by conservation of energy and natural resources across the country. In line with this commitment, Tata Power’s Club Enerji students from Sri Ma Bal Niketan High School and Sri Ma Vidyalaya in Thane East, organised a mega awareness rally in Thane, on the occasion of Gandhi Jayanti to create social awareness around the necessity of energy conservation and to commemorate 148th birth anniversary of father of the nation, Mahatma Gandhi. More than 2,500 students along with the teachers participated in this rally. The objective of the rally was to sensitise a larger audience about the need for energy conservation, and introduce them to the various ways of conserving energy. 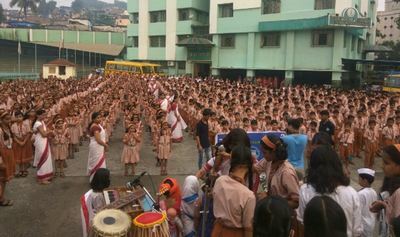 In addition to message on energy conservation, the students also shouted slogans for saving natural resources and environment protection. To prepare for the massive rally, the students enthusiastically created banners, placards and posters on themes of energy and natural resources conservation. A skit was performed as part of the celebration, wherein the students reiterated the values and thoughts of father of the nation and urged people to implement them in their lives. Through this well planned and well executed rally, the students successfully educated 10,000 people. The Club Enerji programme has reached out to over 500 schools in India and has sensitised over 15 million citizens, who in turn have helped save more than 21 MU of electricity till date. The club also has 1,337 self-sustaining mini Club Enerjis and has won several national and international accolades.